On the 200th anniversary of Robert Schumann's birth, an ambitious project is coming to a close: For the first time since Clara Schumann's Complete Edition of 1879-93, all of the works for piano solo are appearing as one editorial project. Spanning almost ten years of painstaking work, all of the Schumann titles published by G. Henle Publishers have undergone a careful revision. The Schumann expert Ernst Herttrich has closely examined each edition and also dedicated himself to those works that were previously missing from our catalogue. The result is being published in this new collection, comprising six volumes, which are available both in paperbound and clothbound editions, as well as study editions in a slipcase. They replace the former four volumes (HN 108-HN 115). 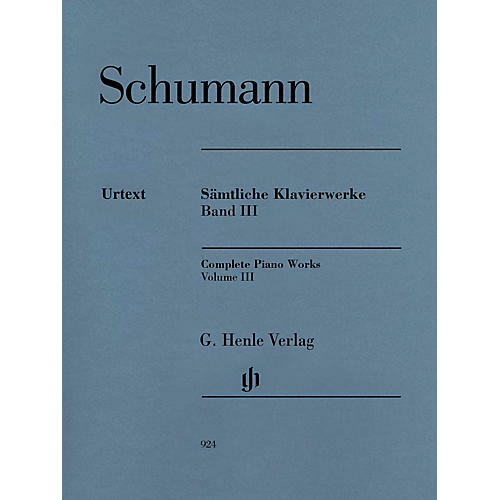 Arranged clearly according to opus numbers, it includes not only all of Schumann's piano works, revised to reflect the latest scholarly findings, but also informative accompanying texts, alternative versions and much more besides.